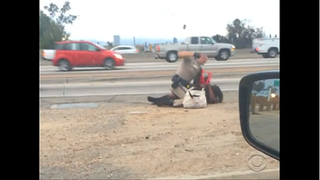 A California Highway Patrol officer is captured on video battering a woman. The California Highway Patrol is investigating the actions of an officer after a video was posted on YouTube showing him brutally beating a woman Tuesday evening beside a Los Angeles freeway, CBS Los Angeles reports. The video shows the officer punching a woman on the ground more than 11 times in the face along 10 Freeway near La Brea Avenue early Tuesday evening, the report says. She does not appear to resist, and the reason for the encounter between the two remains unclear, the report says. The video was recorded by a driver passing nearby. The California Highway Patrol released a statement Thursday saying it was investigating the incident, the television news site reports. The video starts with the officer trying to detain the woman. Eyewitness David Diaz, who recorded the video, told CBS Los Angeles that he saw the barefoot woman walking around the off-ramp when he noticed the officer chasing her around a truck. The officer caught up with her, and after a brief struggle, he took her to the ground and repeatedly punched her in the face, the report says.